Real quick — who’s in your top 10 most inspirational artists in the world? Even quicker, add Amani Yahya to that list! 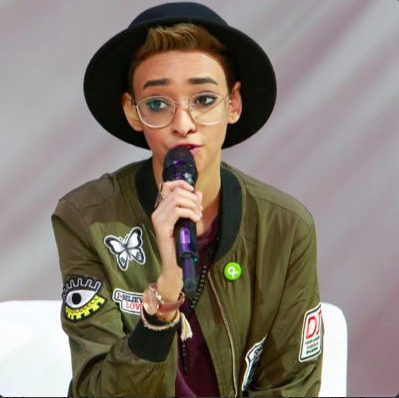 At only 24 years of age, Yahya is considered Yemen’s first female rapper. She began writing during her high school years and found inspiration from artists like Lil Wayne. Although her music career was forcibly halted during her stay in Saudi Arabia, Yahya has since returned to Yemen and began to flourish as an artist. Starting out locally at a nearby coffee shop in Sana’a, Yemen’s capital, she is now an icon for women’s activism in her nation. But with fame comes consequences. As a result of her wide media exposure, the rapper received a lot of side eyes and threats from people within her own community. As a young woman who used her platform to call out gender inequalities through music, Yahya was targeted and accused of being haram and disobedient. To this, she said, “I won’t stop. Deal with it.” She refuses to yield to fear. Amani is determined to use her music to expose issues and start conversations about women’s rights, child marriage and sexual harassment in the Arab world. Her songs are both recounts of personal experiences and stories of people she has met. She often raps in both English and Arabic to strategically reach outside of her community and have a worldwide impact; She wants to show other girls and women that they can speak up too, in their own ways. Amani Yahya is #MuslimGirlFierce and refuses to hide it.